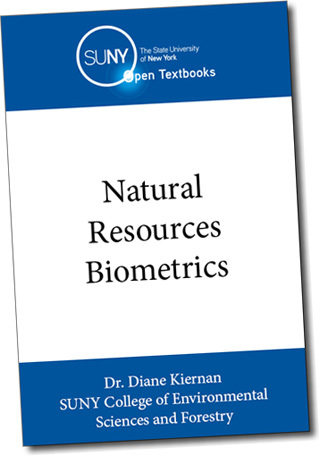 Natural Resources Biometrics by Dr. Diane Kiernan of the SUNY College of Environmental Science and Forestry (ESF), is the latest publication of Open SUNY Textbooks to be published. Open SUNY Textbooks is an innovative program led by SUNY faculty and libraries to help reduce the cost of textbooks and higher education. Through an Innovative Instructional Technology Grant (IITG) under the lead of SUNY Geneso, SUNY libraries are working with would-be authors to produce electronic textbooks that would be free for use by faculty and students. "The average bill for textbooks in the sciences is $600 per semester," said Stephen Weiter, director of college libraries at ESF. "If we can cut that down and make it sustainable it reduces the cost for students at SUNY and makes us more attractive to students." Kiernan's textbook provides students with an understanding of commonly used statistical analysis techniques in a natural resources context. It is currently in use at ESF. Kiernan completed her Ph.D. in quantitative methods in forest science at ESF in 2007 and teaches Introduction to Probability and Statistics and Forest Biometrics at the College. She has authored and co-authored two previous books on statistics currently being used in her classes. "The Open SUNY Textbook program is vital to the future of our public education system," said Kiernan. "As our world goes digital, it is only right that SUNY leads the way in a library of e-books." Open SUNY Textbooks will also offer some titles on Amazon as print titles. Those books would be "considerably less than what students normally pay," Weiter said. Open SUNY Textbooks is in the midst of its second round of textbook proposals, said Weiter. "The interest is high," said Weiter. "It's an exciting place for libraries to be for publishing of text books this way. It's a new way to do acquisitions without the cost. It's a new level of library service."